It’s hard to credit now, but the Urban Pond was only re-lined in early Spring; it’s matured rapidly in the last few months, thanks to being pretty much left to it’s own devices. It has rapidly become a thriving sanctuary for all kinds of wildlife and wild flowers. Perhaps the star of the show is Lissotriton (formerly Triturus) vulgaris, the Smooth or Common Newt. It’s a wonder that they’re there at all, given that the Urban Pond is surrounded on all sides by buildings. 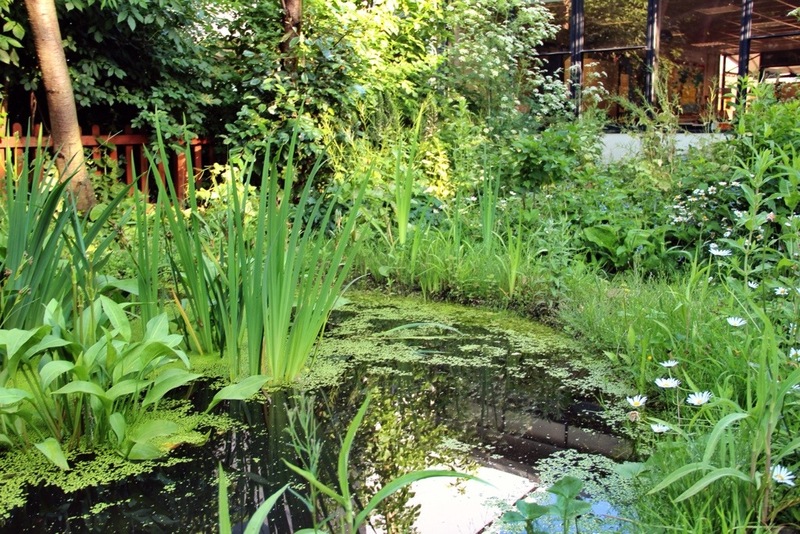 How on earth did they find the pond in the urban jungle? One fascinating hypothesis is that newt eggs travelled in from other breeding grounds on the feet of birds descending to the pond to drink and bathe; another theory is that they’re a remnant of the marshland that once covered this area, until recently the area was called Marsh Croft, and have pretty much clung on in those damp spaces around the wild garden that tend to attract standing water. Smooth newts are adept at adapting to many different environments and they seem to have taken a shine to the Urban Pond, numerous eggs have metamorphosised into juvenile newts and can be seen through the clear water resting in the silt at the bottom of the pond or poking their heads out of the water. 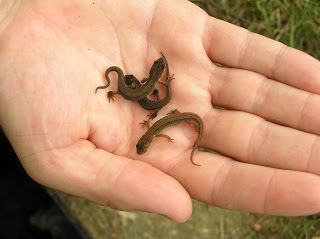 Adult newts emerge from their overwintering sites in early Spring and head to a pond to breed. Males perform an elaborate courtship dance before the eggs are laid. Individual eggs are laid and wrapped up in the leaves of pond plants. I wonder did that happen in the Urban Pond, or did the eggs, laid elsewhere, take part in an accidental migration as passengers on a bird’s foot??? 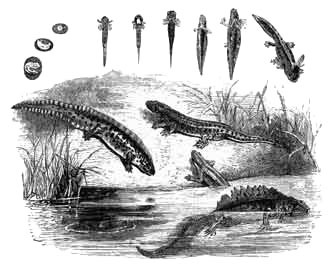 However they arrived in the pond, once on site, it would have taken two to four weeks (depending on the weather conditions) for the larvae – sometimes called (newt) tadpoles – to hatch out. The larvae have feathery gills around the head, distinguishing them from frog and toad tadpoles. 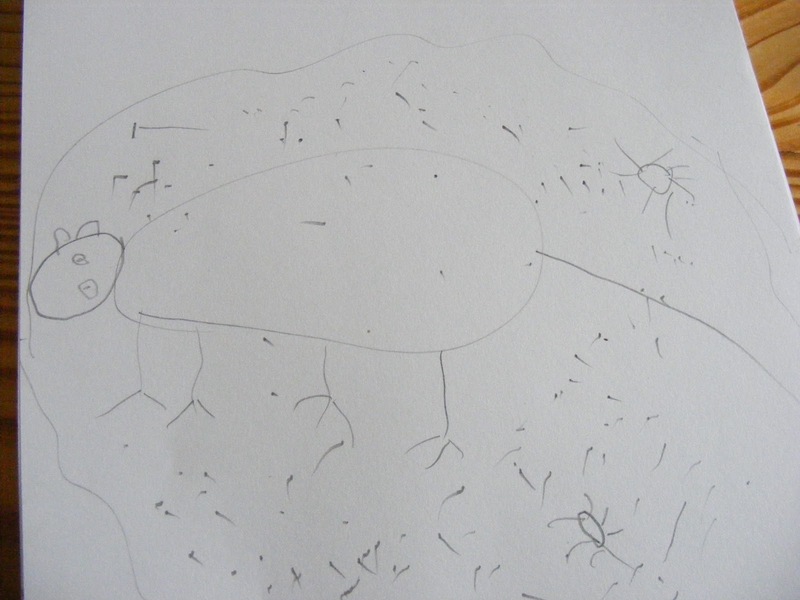 A couple of months after they hatch the larvae start to grow their front legs (ie. different from frogs and toads), followed by the back legs. They still spend quite a lot of time in the water and will hunt frog tadpoles. 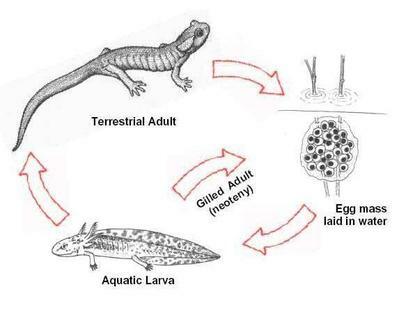 When the larvae have absorbed their gills, they will leave the water as newtlets (or efts). Hopefully the adults will remain in or around pond hunting for food. Later in the summer and in autumn, we’re likely to find newts sheltering under wood, rocks and paving-slabs, feeding-up on slugs and insects in time for winter. They will then tend to over-winter again under rocks or perhaps in the nearby log pile, compost heap or recycling bins. They won’t hibernate as such, and may take advantage of milder periods of weather to come out and forage. Adult newts will grow up to 10 cm in length, and remarkably can live for 15-20 years. Both males and females have greenish-brown upperparts, with a whitish belly and cheeks and an orange streak on the belly, which is more pronounced in males. In the breeding season males develop a wavy crest from their heads to their tails. Outside the breeding season, male and female smooth newts are hard to distinguish – both sexes are of similar size and a similar pale brown to yellow colouration. 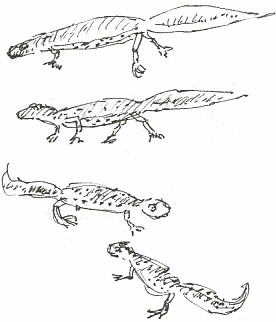 Their main visible differences are two – the male newt has a single black line running down the centre of the spine, the female has two parallel lines on either side of the centre. Common newts are nocturnal and spend their days in hiding. They are most active at dusk and dawn, feeding on invertebrates such as slugs and worms. In the water they hunt insects, tadpoles, water snails and small crustaceans, such as shrimps. They should be pretty fortunate around the Urban Pond because, as yet, their food chain predators such as fish, grass snakes, ducks and kingfishers are not visiting the pond. There’s a Newt Identification Poster HERE.